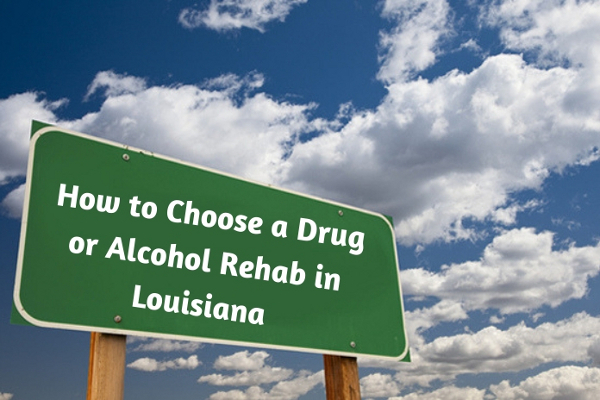 How to Choose a Drug or Alcohol Rehab in Louisiana - GoodGuysBlog.com - New, Technology, Marketing, Health and So on. The abuse of drugs and alcohol has become a national problem in the U.S. The opioid epidemic coupled with existing issues in Louisiana is creating an increased need for viable treatment options. When an addict truly wants help, it’s important to get them into a rehab program as quickly as humanly possible. The longer they have to change their mind about seeking help, the more likely they are to put it off until later—which can mean death for some. Choosing the right drug and alcohol rehab in LA can be the difference between a continuing addiction and a new lease on life. There are so many options available that it can be nearly impossible to know where to start. The right rehab will have the facility, staff, programs, and philosophy to support the addict throughout every step of the treatment and recovery process. Many of the programs in LA are tailored particularly to the issues related to that area—and many are fantastic on an even broader scale. There are times when it can be beneficial for friends or family members of the addict to seek out the best rehab prior to staging an intervention or suggesting treatment. This allows them to provide an instant solution and gives the addict less time to come up with excuses for not agreeing to go. As long as the initial decision is entirely theirs, then it doesn’t matter how they’re convinced to enter rehab. The geographical location of LA makes it extremely vulnerable to the drug trade. Traffickers take advantage of the ports and air routes and treat the state as a gateway for the sale of drugs to southern areas. Because of this, plenty of LA communities are suffering from widespread addiction. With so much of the U.S. experiencing similar problems, there’s a new awareness of addiction and a movement dedicated to providing more accessible rehabs. Treatment facilities have been slow to catch up, but new programs are making them more effective than ever. There are different types of facilities, all offering different services with one similar goal—to treat addiction. When you’ve narrowed down the area where you’ll need to find a rehab, it’s time to start a more involved vetting process. The first thing you should do is start calling prospective facilities. This helps you to get a feel for the service, the way that the company responds to inquiries, and what types of patients the facility can handle. Not all rehabs have direct access to medical professionals working within the building. Some utilize a holistic approach and can’t necessarily handle the medical implications associated with detox. The best chance an addict has at achieving sobriety is a rehab that fits their problem and their personality. Do you take immediate/emergency admissions? Are services available on an income-based plan? Are rooms individual or is it a dorm setting? What types of therapies are offered? What are the credentials of the therapists and professionals working there? Do you have a doctor and/or a psychiatrist on-site and on call? Can you give me an example of a daily program schedule? Do you offer medication-assisted treatment? What types of aftercare programs can you provide? There are a huge number of other questions that you can ask, but these will likely be subjective. Every addict uses for a different reason, so it’s important to find a facility that can address this. It’s also a good idea to do some serious online research about the facilities you’re considering. Check the reviews, their licenses and credentials, and the length of time they’ve been in business. This ensures a quality experience, and lets you know that anyone receiving treatment is in good hands. There is no one-size-fits-all approach to treating addiction. Most addicts who suffer from active substance abuse are both chemically and physically dependent on drugs or alcohol. This means that they need to be treated on both levels. For people that experience serious withdrawals and discomfort, an inpatient program is usually best. This allows them to step out of their usual routine and to surround themselves with life-changing influences. Inpatient programs usually last between 30- 90 days and require the addict to stay and live on campus for the majority of that time. For people that have particularly violent withdrawals, a facility with a medical detox may be necessary. They’ll have access to a doctor and medications that can help the addict get through the withdrawals without becoming violently ill or doing permanent damage. Outpatient programs are usually reserved for people that have already been successful in inpatient treatment, or for those that have other forms of accountability. Most outpatient facilities will provide treatment and educational services anywhere from 4-8 hours a day. This works better for some addicts who require a more flexible schedule, and who are able to abstain from using drugs and alcohol with close supervision. There are also holistic programs that focus on treating addiction without the use of medications or traditional means, taking an all-natural approach. Like we said before, it’s entirely dependent on what the addict needs to be successful. It doesn’t work to send a person who needs methadone to an all-natural facility, or a person who isn’t spiritual to a faith-based program. This can cause the addict to completely reject the program and disrupt the recovery process. The best treatment for addiction is anything that works. As simple as that statement sounds, it’s really a testimony to the individuality of this disease. Choosing the right treatment program in LA needs to be done carefully as it can help save your life.